This is a comprehensive and restorative program to help support your healing process. You will deepen your awareness while connecting body, mind and soul. Come restore and renew yourself with: gentle yoga postures, explore uplifting breathing exercises, indulge in creative imagery, relax in deep yogic sleep, boost your immune system with whole foods & herbs that heal, experience healing touch, and learn meditation techniques that align body, mind and spirit. If you are looking for more vibrant health and greater well-being - this program is for you! In a nourishing and therapeutic space, you will learn how to tap into your full power to live more joyfully. Come experience your fullness of being through opening to present moment awareness. Call us today to find out more about one-on-one programs, group workshops, trainings and self-care group coaching. Don't miss this opportunity to start this comprehensive program today! This chair yoga workshop has become extremely popular because everyone can benefit from these poses. In a step-by-step systematic approach participants learn how to do the exercises on their own. Whether you are sitting, standing or holding on to the chair you are safely working muscles and joints, as well as calming your mind and spirit. Chair yoga poses range from gentle to moderate while stretching and strengthening your body. Numerous participants have reported improved balance and flexibility and emphasize the therapeutic healing benefits. This practice is great for people who want to reduce stress, to help specific injuries, and for those in need of balance and energy throughout the day. This chair yoga workshop is for anyone who is motivated to learn the benefits of a regular yoga practice while navigating through the daily hectic life. With chair yoga you can strengthen and energize your body, sooth your nerves, calm your mind and feel more balanced and centered. WHEN: Call us to book Chair Yoga for your Organization or Yourself! WHERE: On-site at your organization, institution, association, or home. Learn all you need to establish a meditation practice at home. This four week course will give you the foundation to learn the basics, and the resources to continue practicing meditation for years to come. Meditation is effectively being used to treat many diseases and is commonly prescribed as an approach to reduce stress, cope with chronic pain and provide relief from illness. Meditation is now routinely recommended to treat patients suffering from heart conditions, insomnia, depression, anxiety and many more ailments of mind, body and soul. Meditation is successfully being used as a healing instrument in medical practices all across the world. With a meditation practice you begin to gain control of your life to live more effectively and healthfully. 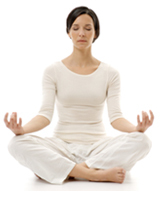 The art of meditation helps facilitate healing and brings awareness, tranquility and mind-body health. To start your four week course, call us today! SIGN UP: To book your private event & customize your day. Planting Fields Arboretum State Historic Park (a former Gold Coast estate of over four hundred acres) is one of Long Island's premiere public arboretums and historic sites. Come indulge in a mind-body-spiritual healing journey and align body, mind and soul. In this outdoor classroom, we will embark on a voyage guided by our life force, our breath. The breath is the energy that nourishes us, connects us to source and is our unlimited reservoir. When we tune into our breath we tap into healing, transformation and empowerment. Amongst the beauty of nature, we will explore how stillness, breath, sound, and imagery can relieve unsteady thoughts and emotions. This is an empowerment yoga adventure where participants will go home with tangible exercises they can use on their own for more joy and peace, including, breath as a healing tool, a rejuvenating mediation practice and a guided relaxation technique. Together, we will stroll through some of the 409 acres including the flowers, gardens, rolling lawns, hiking trails, the greenhouse, woodland paths, and plant collections. Get a glimpse of what is would have been like to live in a Gold Coast Estate on a tour of one of the few remaining super mansions, Coe Hall. We will hike through the woodland paths enjoying the lush greenery and deciduous trees and flowering plants. Enjoy the natural beauty of Planting Fields as we meander through the sculpture garden, have fun, relax and rejuvenate. Pack a lunch and some snacks to enjoy for our group picnic. Planting Fields Arboretum State Historic Park is one of Long Island's premier public arboretums and historic sites; it is an ideal location for a day of healing, rejuvenation and adventure. We will breathe, fully and deeply, connecting the in and out breath, and begin to awaken to present moment awareness and true JOY!" Don't miss this chance to get back to nature and learn how to tap into your true power! This on-going program is for anyone that wants to experience deep healing. Experience a journey of self-exploration, rejuvenation, renewal and empowerment. This work inspires you to tap into your personal power and encourages your transformation. Connect with your inner sanctuary and experience mind-body-spiritual exercises that are dynamic and transformational healing tools. Indulge in energetic and healing mind-body-spiritual exercises. See firsthand, how breath, stillness, meditation and vibrational healing can rejuvenate and renew you. Together, we will explore: meditations, sound healing, a guided visualization, chakra balancing, partner exercises and transformational breath work. All are welcome. Whether you are a newcomer or an experienced mind-body practitioner, this group can inspire self-exploration and personal growth, empowering you to live vitally, in balance and with greater awareness. Mind-body-spiritual techniques have been proven to vitalize and rejuvenate the spirit. These exercises work on the physical, emotional, mental and spiritual levels to bring about a state of equilibrium, harmony and boost your immune system. You will learn mind-body tools & strategies that you can apply in your daily lives. Now is the time, to claim your full power. Are you ready to give yourself over to healthier habits, beliefs and behaviors? The mind-body-spiritual techniques you will learn at this workshop can help you rediscover optimal health and well-being. Come and experience a mind-body-spiritual healing retreat and connect your consciousness to the infinite. Don't miss this inspirational journey to your inner sanctuary and self healing! SIGN UP: To book a private healing session or group event. Come and experience a full moon or new moon healing session. The full moon and new moon is a perfect time to honor lunar energy as you give and receive many blessings. The new moon and full moon times are an opportunity for you to release, manifest, create and bring harmony to the physical, emotional, mental, and spiritual. We will explore spiritual aspects of self and indulge in the healing gifts of feminine lunar energy. Come to your heart center abode of the soul and connect to your true nature. Indulge in a spiritual healing journey and align body, mind and soul. LUNCH WILL BE PROVIDED. We will share a picnic. SIGN UP: For more information and to customize your trip. This is an incredible opportunity to learn more about YOGA. We will journey to a tranquil beachside lake for a guided yoga experience. You will indulge in a rejuvenating, restorative and educational yoga experience and mind body experience. Best of all; you will go home with a YOGA practice, including a yoga asana sequence, breathing exercises that calm and energize, and a meditation technique you can use on your own, at home or while traveling. We will take a dynamic wooded intermediate level 3.5 mile hike on a portion of the world-renowned Appalachian Trail in New Jersey's Stokes State Forest. At our scenic rest site you will have the opportunity to engage in a group meditation and learn a couple of meditation techniques. Come enjoy dynamic views of scenic New Jersey from Sunrise Mountain. The day includes a picturesque destination where you can see the Delaware Water Gap to the far south and the High Point Monument to the north. The lake to the south is Kittatinny, and the larger lake to southeast is Culvers. Overall, an incredible day hike and yoga experience. If you always wanted to be able to practice YOGA on your own this is a wonderful occasion to learn from Jara T. Weiss, she has been teaching for over a decade and yoga is her life. Don't miss out on your chance to have a personal YOGA practice. This trip fills up fast! Grounds for Sculpture is a 35-acre public sculpture park. Come experience a tranquil, harmonizing, fun, and cultural outing. In the midst of sculptures and nature, we will unwind by a serene lake and explore transformational breathing exercises and a balancing chakra meditation. We will tour the landscaped environment of the outdoor permanent collection as well as see the indoor seasonal exhibition. There are sculptures in a variety of mixed styles and media, including bronze, steel, stone, wood, and concrete. We will begin our day with a tour of a Tibetan Buddhist Monastery beautifully situated in the heart of the Catskill Mountains above Woodstock, New York. The day will continue with a steep hike to Overlook Mountain. The Overlook offers incredible views of the Hudson River Valley, the Ashokan Reservoir, and the Devil's Path. At the top of Overlook Mountain, we will have a group meditation, relax, and share time together. After the hike, we will stroll through the town of Woodstock, dotted with shops and noted for exhibits of fine arts, crafts, antiques, and rare books. Ricketts Glen State Park is a national, natural landmark of 22 waterfalls, 21 which we will view via the Falls Trail, a 7.2 mile, intermediate loop trail that takes about 4 hours to hike. Our time together begins with energizing yoga practice and vitalizing breathing exercises to prepare us for our 7.2 miles of 21 waterfalls on the mountainside terrain. At the grand waterfall, you can go for a swim, have a rest, eat your snack, and soak up the sun. See Pennsylvania as you never have before, while indulging in this beautiful landscape of waterfalls. SIGN UP: For more information. The Medicine Lodge (Sweat Lodge) is a ritual, purification, and medicinal journey of the Native American Indians. Are you ready to have more strength, serenity and joy in your life? This "sweat lodge" can facilitate a REBIRTH and bring about a long awaited shift. Together--from uniting our energies--we will experience four doors of healing, prayer and harmony. We enter the Grandmother, a place of safety, sharing, releasing, and cleansing. This spiritual and detoxifying ceremony allows you to be reborn into your world. Before our heritage had written word, men and women gathered in the womb of the Grandmother to cleanse, heal, and pray. This ceremony is ancient, and is considered a rebirthing and a spiritual reawakening. Think of this experience as a walk through an ancestral door into a healing of the spirit to transcend thought and story. We will begin our ceremony at noon on the eve of the New Moon and journey through spiritual purification until 3pm. After the medicine lodge, we will gather to talk, share our experiences, and nourish our soul with a feast from 3pm until 5pm You are free to stay for the potluck or leave right after the lodge. Please, if you are staying for the potluck you MUST bring a vegetarian dish, a living foods preparation or ingredients for the potluck: fruits, salad, vegetables, greens, nuts, seeds, seaweeds, or any foods that are considered "living foods." The Mind-Body Empowerment Experience is a full day of self-exploration, awakening, and rejuvenation. This experiential exploration features exhibitors, speakers, presenters, mini-workshops, musical performances, and an evening drum and dance circle. 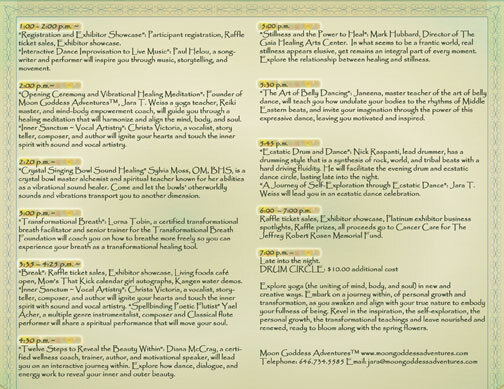 There are several interactive experiences, including the opening ceremony, meditation, vocal artistry, transformational breath, sound healing, the journey within, belly dancing, dance improvisation, stillness and the power to heal, ecstatic dance, and the power of the drum. 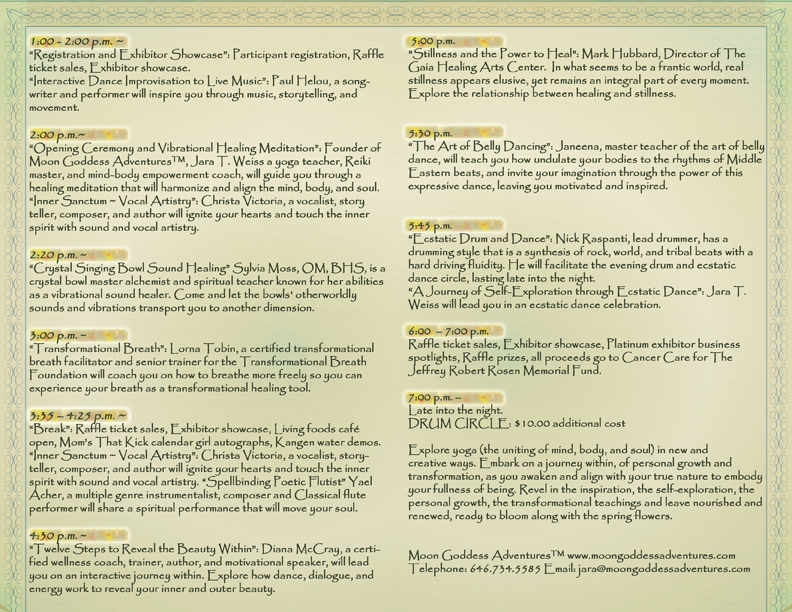 Come experience how movement, breath, stillness, meditation, and vibrational healing can rejuvenate and renew you. 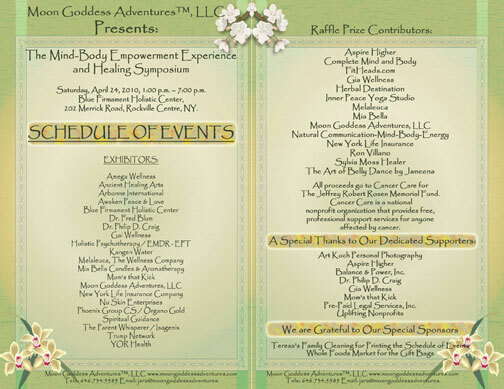 The event will highlight a diverse group of exhibitors that will fill the venue with health and wellness information, products, services, and literature relevant to mind-body-spiritual harmony. 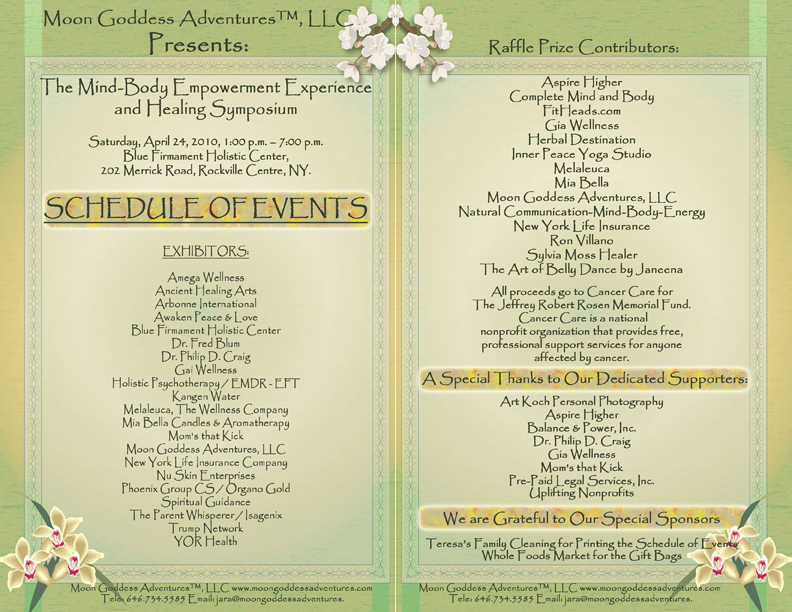 Participants may purchase healing sessions, including network chiropractic, chair massage, polarity therapy, chakra balancing, Reiki, tarot card readings, energy work, and other mind-body-spirit healing offerings. The Raw Food Cafe is open all day. Retreat and leave your responsibilities behind. This mind-body-spiritual day retreat is an experience, an exploration, and an invigorating celebration. Fundraiser and Raffle for Cancer Care - The Jeffrey Robert Rosen Memorial Fund. "Opening Ceremony & Vibrational Healing Meditation" Center with a healing meditation that will harmonize and align the mind, body, and soul. 'Inner Sanctum ~ Vocal Artistry" Vocalist, storyteller, composer, and author will ignite your hearts and touch the inner spirit with sound and vocal artistry. "Crystal Singing Bowl Sound Healing" Crystal bowl master alchemist ignites sounds and vibrations that transport you to another dimension. "Transformational Breath" Transformational breath will allow you to breathe more freely so you can experience your breath as a transformational healing tool. 3:35 p.m. - 4:25 p.m.
"Interactive Dance Improvisation to Live Music" A songwriter and performer will inspire you through music, storytelling and movement. "Bamboo Flutist" A star flutist will take us on an astral voyage around the globe for a sonic sampling of our world's richest cultures. "Twelve Steps to Reveal the Beauty Within" A certified wellness coach, trainer, author, and motivational speaker, will lead you on an interactive journey within. Explore dance, dialogue, and energy work to reveal your inner and outer beauty. "Stillness and the Power to Heal" Explore the relationship between Healing and Stillness. "The Art of Belly Dancing" Undulate your bodies to the rhythms of Middle Eastern beats, and invite your imagination through the power of this expressive dance, leaving you motivated and inspired. "Ecstatic Drum and Dance" Lead drummer, has a drumming style that is a synthesis of rock, world, and tribal beats with a hard driving fluidity. Journey through self-exploration through ecstatic dance. Enjoy an ecstatic dance celebration. Raffle ticket sales, All proceeds go to Cancer Care for The Jeffrey Robert Rosen Memorial Fund, Exhibitor showcase, Platinum exhibitor business spotlights. Explore yoga (the uniting of mind, body, and soul) in new and creative ways. Embark on a journey within, of personal growth and transformation, as you awaken and align with your true nature to embody your fullness of being. Come for the inspiration, the self-exploration, the personal growth, the transformational teachings - and leave nourished and renewed, ready to bloom along with the spring flowers. Opening Ritual, Yoga, Emotional Freedom Technique, Ecstatic Dance, Storytelling, Laughter Yoga, Heart-Centered Meditation, Raw Foods Demo, Mind-Body-Heart Connection, Living Foods Demo, and Potluck Dinner. You will want to bring a yoga mat or towel, lunch, and water/snacks to nibble on throughout the day. We have scheduled 6 mind-body spiritual programs throughout the day, an evening living foods demo, and an organic vegetarian potluck. 11.15 a.m. - 12.30 p.m.
12.45 p.m. - 1.45 p.m.
1.45 p.m. - 2.15 p.m.
2.15 p.m. - 3.15 p.m.
3.30 p.m. - 4.30 p.m.
4.45 p.m. - 5.15 p.m.
6.00 p.m. - 7.15 p.m.